At the invitation of Ding Xuexiang, member of the Political Bureau of the Central Committee of the Communist Party of China(CPC), member of the CPC Central Committee Secretariat and Director of the General Office of the CPC Central Committee, Anton Vaino, Chief of Staff of the Presidential Executive Office of the Russian Federation will visit China from October 16 to 17. 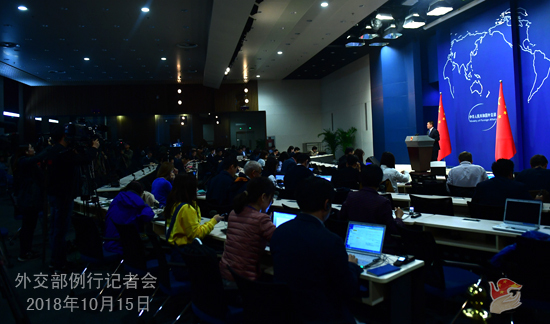 At the invitation of the Russian side, Yang Jiechi, member of the Political Bureau of the Central Committee of the CPC and Director of the Office of the Central Commission for Foreign Affairs, will travel to Russia for the 15th Annual Meeting of the Valdai International Discussion Club from October 17 to 19. Q: According to reports, on October 13, State Councilor and Foreign Minister Wang Yi had a telephone call with Mexican Secretary of Foreign Affairs Luis Videgaray Caso at request. The Mexican side briefed the Chinese side on the United States-Mexico-Canada Agreement (USMCA), saying that the agreement will not put any restrictions on the economic, trading and political relations between Mexico and China. What's your comment? A: On the night of October 13, State Councilor and Foreign Minister Wang Yi had a telephone call with Mexican Secretary of Foreign Affairs Luis Videgaray Caso at request. Secretary of Foreign Affairs Luis Videgaray Caso informed the Chinese side of the situation surrounding the signing of the United States-Mexico-Canada Agreement (USMCA) between the Mexican government, the US and Canada. During the talk over the phone, Secretary of Foreign Affairs Luis Videgaray Caso clearly stated that Mexico is an independent sovereign state and the relevant agreement will neither affect exchanges between Mexico and China in any way nor put any restrictions on trade, investment and political relations between the two. He also unequivocally stressed that China is a trustworthy partnership for Mexico and the Mexican side is willing to further develop the bilateral comprehensive strategic partnership. The Chinese side appreciates this. Last week I also briefed you on the telephone call between State Councilor and Foreign Minister Wang Yi and Canadian Foreign Minister Chrystia Freeland. The Canadian side also made it very clear that the USMCA should not undermine other countries' legitimate interests. The Canadian side will make its own decisions when its comes to FTA negotiations with other countries. The Chinese side is always committed to upholding free trade and the WTO-centered multilateral trading system and firmly opposes all forms of protectionism and practices of double standards under various pretexts. We hope that free trade arrangements in all regions could follow the principle of openness, transparency and inclusiveness, create freer and more convenient environment for global trade, and enhance the benefits of people around the world. We are ready to work with Mexico, Canada and other members of the international community to jointly maintain multilateralism and the global free trading system. Q: According to reports, Pakistan officially proposed that it hopes the International Monetary Fund (IMF) could offer emergency loans to help it deal with the current economic difficulty. The IMF will send task force to Pakistan for talks. Some media believe that Pakistan asking for help from the IMF has something to do with the debt incurred by the China-Pakistan Economic Corridor (CPEC), which leads to "debt traps". What is your comment? A: The China-Pakistan Economic Corridor (CPEC) is a project co-built by the Chinese and Pakistani governments under the principle of extensive consultation, joint contribution and shared benefits. The choice of the projects and financing arrangements are decided by our two sides through equal-footed consultation. In fact, you may have noted that according to what is released about the debt structure by the Pakistani government, the debt incurred by CPEC makes up a very small proportion of Pakistan's debt composition and it is not to blame for the current financial difficulty in Pakistan. I would like to clearly point out that the Chinese side is willing to join hands with Pakistan to continuously enrich and expand CPEC building and help the Pakistani side enhance its capacity for self-driven development. As a member of the IMF, China supports the organization in objectively and professionally evaluating the situation in Pakistan and earnestly helping it properly address the current difficulty. The relevant measures should not affect the normal bilateral cooperation between China and Pakistan. Q: The IMF has already said that they will be scrutinizing the Chinese loans provided to Pakistan. And the US officials have indicated that they will also scrutinize the Chinese loans to Pakistan before the IMF takes any decision on this. Do you have any comment on this? A: Recently there are many discussions over Pakistan's debt issue and the financial difficulty it incurred. Like I just said, if we take a look at the country's debt structure as released by the Pakistani government, the debt incurred by CPEC only constitutes a very small proportion of Pakistan's debt composition and it is surely not to blame for the current financial difficulty in Pakistan. Officials of relevant departments in the Pakistani government have already made this point very clear in recent remarks.As a member of the IMF, China supports the organization in objectively and professionally evaluating the situation in Pakistan and earnestly helping it properly address the current difficulty. Just as I pointed out, the relevant measures should not affect the normal bilateral cooperation between China and Pakistan. Q: The US leader recently claimed that the Chinese side has threatened the stability across the Taiwan Strait by persuading three Latin American countries to sever the so-called "diplomatic ties" with Taiwan. What is your comment? Firstly, there is only one China in the world and Taiwan is an inseparable part of China's territory. This is the general consensus shared by the international community. China has established diplomatic relations with the relevant countries on the basis of the one-China principle, which is a sovereign right enjoyed by China and the relevant countries as sovereign states. It also fully conforms to the international law and the basic norms governing international relations, corresponds with the irresistible trend of history and the times, and meets the aspirations of the people. As early as nearly four decades ago, the United States established diplomatic ties with China in accordance with the one-China principle, but now it points fingers at or even flagrantly hinders other countries when they did the same. This does not make any sense. Secondly, it is the "Taiwan independence" forces and their separatist activities that pose the biggest threat to the peace and stability across the Taiwan Strait. The Democratic Progressive Party authorities in Taiwan are trying to undermine the status quo that the two sides of the Taiwan Strait belong to the same country and the relations across the Strait are not state-to-state relations, which not only hinders the peaceful development of the cross-straits relations but also erodes regional peace and stability. The international community should say no to this. By severing their relations and making a clean break with the Taiwan authorities who are undermining the status quo across the Strait, the relevant countries have upheld the international consensus of the one-China principle and played a positive role in maintaining cross-straits peace and stability. Thirdly, I have to point out that the US side recently took a string of wrong actions on the Taiwan issue, including allowing the leader of the Taiwan region to make "stopovers" in the US and announcing the plan of arms sales to Taiwan. 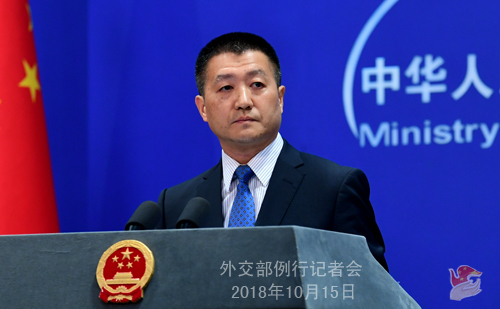 Such acts have severely violated the one-China principle and the stipulations of the three China-US joint communiques, emboldened the "Taiwan independence" forces and harmed China-US relations as well as cross-straits peace and stability. The Chinese side urges the US side to correct its mistakes, stop any official and military ties with and arms sales to the Taiwan region, stop harassing those countries that have already established or hope to establish diplomatic ties with China, and earnestly restrain the "Taiwan independence" forces to avoid harming China-US relations and peace and stability across the Taiwan Strait. 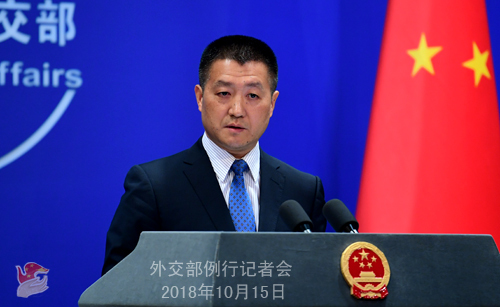 Due to scheduling reasons, the regular press conferences of the Foreign Ministry on October 16 (Tuesday) and October 17 (Wednesday) will start at 2:30 p.m. at the same venue.